Most people think of machine guns, endlessly crackling into waves of oncoming infantry, as the great killing machines of the First World War. In truth it was the artillery that caused most of the deaths, but in the opening year, the machine gun was the great reaper of lives. Most Anglo-Saxons, brought up on tales of the Somme and Passchendaele, think instinctively of the trench warfare of the Western Front as where the heaviest losses and greatest butchery took place. In reality the loss rate of both the Entente and the Central Powers was at its greatest in the open warfare in the start and end of the war. Nowhere was this more evident than on the Eastern Front in 1914. At a conservative estimate, about 1 million casualties were taken in a couple of months and a very large proportion of these fell to the relatively few machine guns that were in operation. First we cover those of the Imperial Russian Army which take a prominent role in August 1914 and Fall of Empires. As mentioned before (see Daily Content's Armies of the Tsar), it is a grave mistake to assume that the Russians were badly equipped. They may have had abominable and self-serving senior officers, their heavy guns may have been emplaced in fortresses instead of supporting infantry, but there was nothing wrong with their infantry weapons. The Maxim M1910 on its extendable legs. The most important was the Maxim M1910 medium machine gun whose working parts were an almost exact copy of the British 1905-pattern gun. Almost because it fired the Russian 7.62mm cartridge (known as the "three-line," in other words .30) rather than the British .303. It had a water-cooling jacket wrapped around the barrel, was automatic-only, and fired at 600 rounds per minute from canvas cartridge belts. Experts on the Panzer Grenadier system should note that this was close to its realistic sustained rate of fire, unlike weapons such as the MG-42 and Bren, which could only reach less than half that rate due to the need to change barrels and/or check firing to cool the barrel. For all practical purposes it was also identical to the German sMG 08, weighing a bit less at 44 pounds, though still with another nine pounds of water in the jacket. Most thought it superior to the Austro-Hungarian Schwartzlose (seen in Fall of Empires), but believed the Maxim inferior to the significantly lighter British Vickers that appeared in 1912. Weight was a critical issue in the 1914 battles, with all armies (after the first shock of battle) seeking ways in which to move machine guns quickly, under cover and to suitable positions. The Russians had something of an edge in this as they had used Maxim guns (in this case the older 1895 version) in the war against Japan in 1904. They had been mounted on both tripods and the axles previously used by light artillery and were notably effective, inflicting extremely high casualties in the battles around Mukden. Hence the development of the Sokolov shield/carriage, which gave the Russian gun its distinctive and unique appearance. The carriage ended in a U-shape, allowing the gun to be dragged over the battlefield on its wheels. This could be neatly folded, so allowing the Maxim to be fired from a narrow trench. The earliest versions of the mount even had extendible, folding legs that allowed the gun to be raised higher, giving more protection to the crew when in a trench, but this was abandoned as costing too much time and money to produce. Of course its weight of another 95 pounds (meaning that the whole device weighed 155 pounds not counting the ammunition!) was more than a minor problem. But the Tsar had lots of riflemen, and additional men were attached to each machine gun platoon to act as ammunition carriers and tugs. 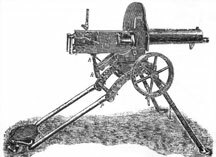 The Maxim M1910, on its Sokolov wheeled mount, with legs folded. The real problem was the shortage of guns. Each four-battalion regiment was supposed to have a company equipped with eight machine guns (four in the two-battalion rifle regiments) and each cavalry division another eight. There were nothing like enough of the 1910 Maxim for the vast Russian army (over 2,000 weapons required for the infantry and rifle divisions alone). Naturally the elite units (guard, grenadier and Siberian rifle regiments) and those assigned to the six armies that opened the Russian offensive were completely equipped. But others, especially the 35 reserve divisions that were mobilized soon afterwards, either lacked guns or had to make do with other types. Three types were the most common, one being the old 1895 Maxim. Another was the American Colt-Browning of 1895, known as the "potato-digger" for its long swinging recoil arm under the barrel. This was most unpopular as the design meant that the gun had to stand high above the ground — satisfactory when built, but a disastrous feature when placed within enemy modern rifle range! The third was very unusual for the time, the world’s first magazine-fed light machine-gun made by Madsen in Denmark. The Russians tried desperately to produce large numbers of this gun, but it was much more complex and with closer tolerances than the Maxim so relatively few weapons were produced during the war. In the end their new factory at Kovrov did become useful, being where Degtyarov, the great Russian designer, created and built the DP-27 LMG with its distinctive pan magazine, that would serve during the Great Patriotic War. In the opening battles (just as on the Western Front) the machine gun started out as a minor asset, tolerated by regiment and battalion commanders who cared for little but the attack, preferably with the bayonet. By most accounts it took less than a week for attitudes to change, as the placement and use of Maxim detachments in defense and their hurried movement in an advance became the most important decision of any infantry commander. Players can do so as well in the Infantry Attacks series. Join the Gold Club and find out how to get Fall of Empires before anyone else!